The goal of the RoboShop project is to make a robot for services into a shopping mall. From the hardware point of view, we are using two wheeled robots, equipped with a laser SICK 300 range finder, as well IR and sonar telemeters (see Picture 1). Each robot has a pole that is about 1.5 m heigh. It holds a tablet PC and Pan/Tilt camera. On the software side, we have chosen the ROS middleware. The rational behind this choice is that ROS is backed by an active community, structured around Willow Garage and more recently the Open Source Robotics Foundation (OSRF). On the programming side, we took the reflective language Pharo. As Object-Oriented experts, we believe that Pharo is among the best (if not THE best) object-oriented programming language. Besides, it’s available under a free software license, and it’s community (backed by the INRIA french public research organization dedicated to computer science) is continuously improving it. The first step was to develop a ROS client in Pharo: PhaROS = PHAro + ROS (initially named RoSt). So far, we have a first complete, running version. We have also developed a ROS node to control our robot. 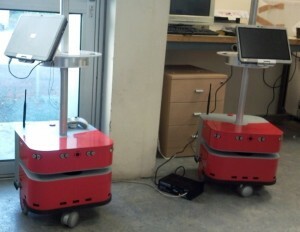 As a first validation, we drove the robot inside our lab and make it build a map (see Picture 2). That was also an opportunity to test our client with a third party ROS node, namely gmapping. We fed this Synchronous Localization And Mapping (SLAM) algorithm with data from the laser embedded on the robot. 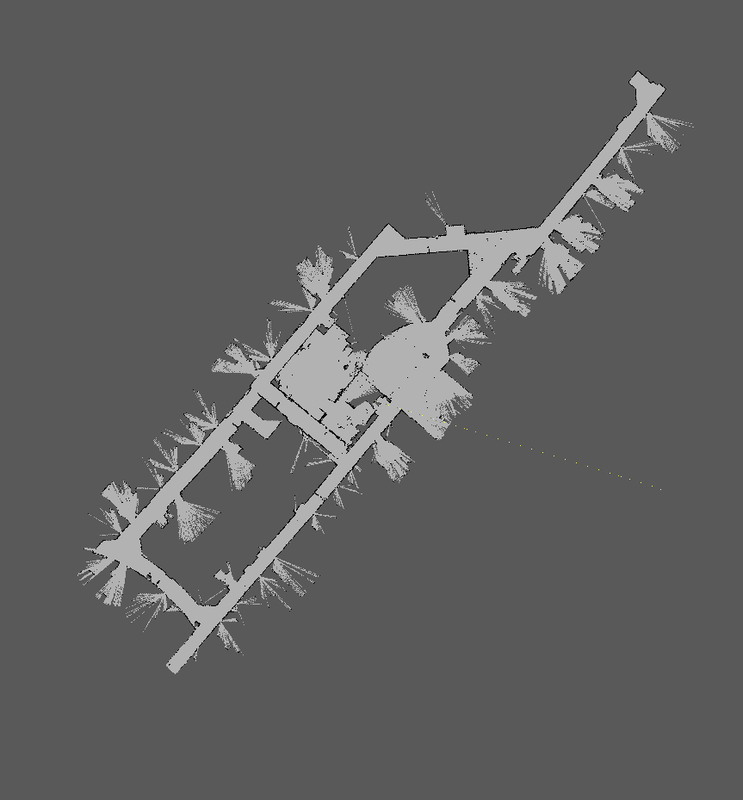 We are currently working on automatic map construction. The robot should be able to roam autonomously to build the map. This will lead us to test other parts of our infrastructure. 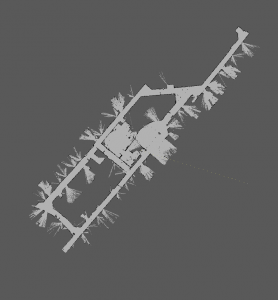 Ultimately, the robot should be able to navigate in the building based on the existing map. It should be able to plan its trajectories to reach it destination while avoiding obstacles even if they are not on its initial map. Such obstacles include moving ones such as people or other robots. Posted in Highlights, News, Pharo, PhaROS, RoboShop.